1. (Endless Trial) 30 day agreement, unlimited music and message changes delivered on the patented Net Smart On Hold Internet web based player. 2. Music on hold and custom marketing message production for on hold equipment you already own. 3. Phone on hold equipment to purchase with royalty free music and customized messaging packages. 4. Wholesale pricing for multiple locations. 5. Message Prompts for Voice Mail System, IVR Systems, and Automated Telephone Attendants. "Quit anytime you like 30-Day Agreement." Welcome to the Customer Care Message On Hold Wholesale Web site. Have you heard? Customer Care Messages On Hold now offers the revolutionary, patented NetSmart On Hold net based player. This web based system allows unrivalled control over on hold programs from any computer with Internet access, simply, with the click of a mouse. Manage any number of players anywhere in the world individually or as a group; or, create schedules that update music and messages automatically. 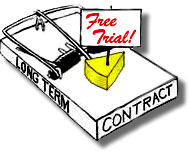 State-of-the-art on hold equipment with our famous "no commitment... quit anytime you like!" agreement, with unlimited message changes, still only $59 a month! With other on hold message companies, you're locked into long-term leases you might not like, for outdated technology you might not be happy with, and at a cost you didn't have to spend! With Customer Care Messages on Hold, you can change your on hold messages as often as you like anytime you like, and quit whenever you feel like it. No questions, no hassles..... no kidding! So, how can we do this? VOLUME, PATENTED TECHNOLOGY, and SUPERIOR CUSTOMER SERVICE, that's how. There are no hidden costs and no secret agendas. We can just simply make less, because we sell more. Thanks for stopping by Customer Care Message On Hold's Web site. We urge you to shop price, contract terms and the available technology of other on hold message companies... and find out what many people already know. The only choice for on hold messaging is Customer Care Messages On Hold Wholesale. Able Disabled Programming Group, LLC.